The margay is a rare cat, closely resembling the ocelot and found in the rainforests of Mexico and Central and South America east of the Andes mountains. Its fur is grayish to cinnamon in color and covered with dark brown spots. The head is rounded and short, and the eyes are very large. Adults range from 18.2 to 31 inches in length and weigh between 5.73 and 8.6 lb. The tail can grow up to 20 inches (70% of its body length). 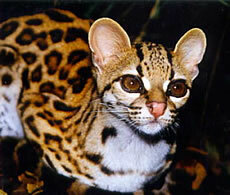 The margay is a very skilled jumper and climber and is sometimes called the "tree ocelot." It is the only cat species that can climb down a tree head first like a squirrel. This is achieved by rotating the ankles around 180 degrees while heading down the tree toward the forest floor. Margays are also known to hang from tree branches with only one hind foot. The margay is mainly nocturnal, but is also active in the day, preferring to spend much of its time in the trees. 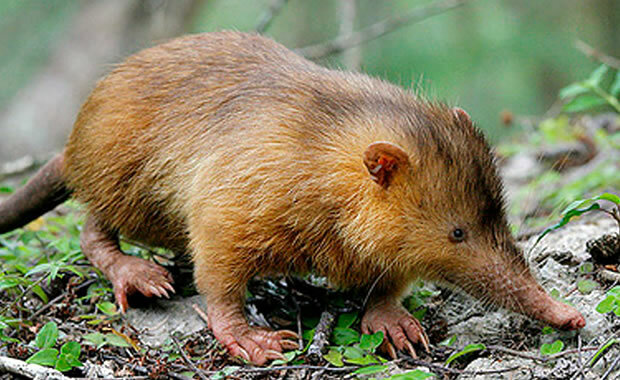 It is very secretive and prefers the more remote and dense areas of the forest. Diet consists of rodents, monkeys, lizards, birds, tree frogs, and fruit, and the majority of prey is caught by leaping through the trees. This species is solitary except when ready to mate. Mating can occur year round, and the female gives birth to one or two kittens after a gestation period of 70 days. The nest for the kittens is made in a hollow tree hole. The main threats to the species is hunting for its fur and the pet trade and habitat loss due to deforestation. The margay does not adapt well to human disturbance, and is almost extinct in the northern parts of its range. Hunting has decreased significantly due to international protection, but illegal harvesting still occurs locally. Copyright Notice: This article is licensed under the GNU Free Documentation License. It uses material from the Wikipedia article "Margay". Glenn, C. R. 2006. "Earth's Endangered Creatures - Margay Facts" (Online). Accessed 4/22/2019 at http://earthsendangered.com/profile.asp?sp=254&ID=9.